Do you have unredeemed Tournament Rewards? Click here for more information. Treasure Island is excited to unveil Treasure Chest, our all-new year round loyalty program. Use the points you accumulate playing your favorite slots at TI to redeem a variety of brand name merchandise including Michael Kors, Rachael Ray, Klipsch, Samsung, Tissot and KitchenAid or use FREE SLOT PLAY. 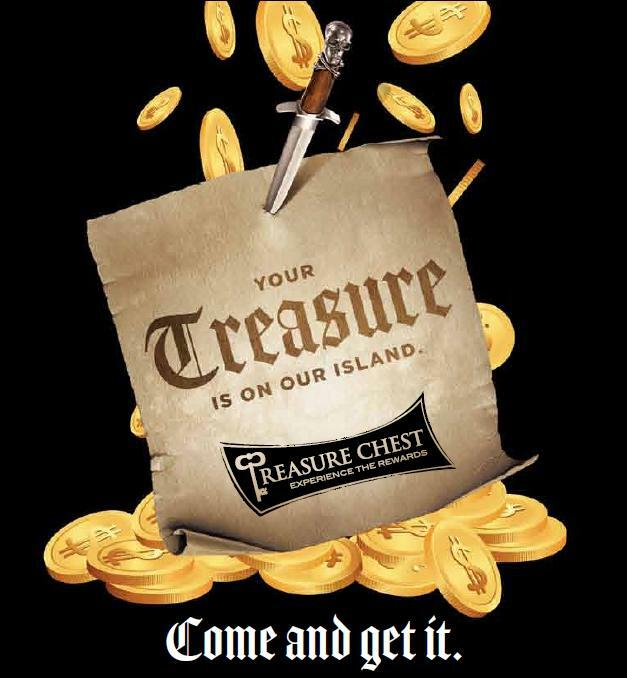 You earn Treasure Chest Points (TC Points) by playing your favorite slots at Treasure Island. TC Points are in addition to your other Treasure Island Players Club benefits and are accrued automatically. You’ll earn one TC Point for every TI Players Club Point earned. Point earning began Jan 1, 2010 and you will be able to start redeeming your points starting June 1, 2010 at the TI Players Club. Keep an eye on your e-mail and TreasureIsland.com for further details, product catalogs and event promotions related to Treasure Chest. Please call casino marketing at 800-944-3777 if you have any questions.